Master Sgt. 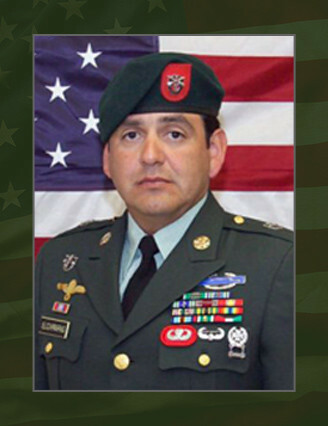 Emigdio E. Elizarraras, 37, a Special Forces Intelligence Sergeant assigned to 3rd Battalion, 7th Special Forces Group (Airborne) at Fort Bragg, N.C. died Feb. 28 when an Improvised Explosive Device detonated while he was traveling in a Ground Mobility Vehicle north of Tarin Kowt, Afghanistan during a reconnaissance patrol. Elizarraras, a native of Pico Rivera, Calif., enlisted as an infantryman in 1986. His first assignment was with 1st Bn., 327th Infantry Regiment at Fort Campbell, Ky., where he served for four years, deploying to Operations Desert Shield and Desert Storm during that time. Elizarraras then transferred to 1st Bn., 14th Infantry Regiment at Schofield Barracks, Hawaii, where he served almost three years before becoming an instructor at the Western Hemisphere Institute for Security Cooperation at Fort Benning, Ga. After serving for three years as an instructor, he volunteered for Special Forces training. He graduated from the Special Forces Qualification Course in 1998 and was assigned to 3rd Bn., 7th SFG (A), as a Special Forces Weapons Sergeant. In 2003, he was assigned as an SF Intelligence Sergeant and served in that position until his death. His military education also includes the Ranger Course, the Special Operations Target Interdiction Course, the Advanced Special Operations Techniques Course, the Individual Terrorism Awareness Course, the Basic Military Mountaineer Winter Course, the Survival, Evasion, Resistance and Escape Course, the Special Forces Assessment and Selection Course, the Basic and Advanced Airborne Courses, the Static Line Jumpmaster Course, the Primary Leadership Development Course, the Basic and Advanced Noncommissioned Officer Courses and the Air Assault Course. Elizarraras’ awards and decorations include the Army Commendation Medal with three oak leaf clusters, Joint Service Achievement Medal with two oak leaf clusters, Army Achievement Medal with silver oak leaf cluster, Army Good Conduct Medal, National Defense Service Medal, Southwest Asia Service Medal, Global War on Terrorism Expeditionary Medal, Global War on Terrorism Service Medal, NCO Professional Development Ribbon, Army Service Ribbon, Overseas Service Ribbon, Kuwait Liberation Medal (Saudi Arabia), Kuwait Liberation Medal (Government of Kuwait), Combat Infantryman Badge, Expert Infantryman Badge, Parachutist Badge, Air Assault Badge, Basic Marksmanship Qualification Badge, Ranger Tab and the Special Forces Tab. His posthumous awards include the Bronze Star Medal for valor, the Purple Heart, the Meritorious Service Medal and the Combat Infantryman Badge. Elizarraras is survived by his wife, Kris, daughters, Sally and Olivia, and son, Andrew, of Fayetteville, N.C. His parents, Emigdio and Martha, of Pico Rivera, Calif., and sister Leticia of Phoenix, Ariz., also survive him.